In addition, carriers moving under the provisions of a single-trip routed permit (excluding manufactured housing and portable buildings) will not be routed on the main lanes of this segment when the width of the vehicle or load exceeds 16 feet. Further, a surety bond does not authorize the operator to transport solid waste or recyclable materials on IH14 in excess of the weights allowed without a surety bond. 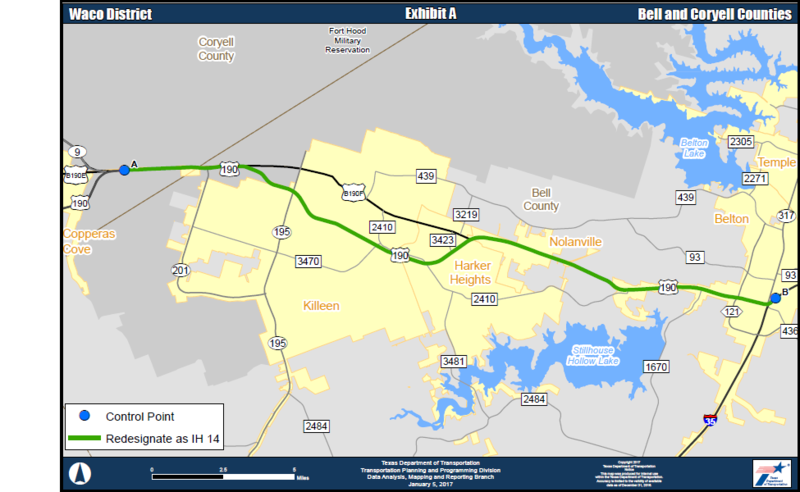 Continuous frontage roads are present on this 25-mile segment from West Business 190 in Killeen to IH35 in Belton. Frontage roads are not continuous between Killeen and Copperas Cove.